Former England batsman Kevin Pietersen will play for the St Lucia Zouks in this year's Caribbean Premier League (CPL) Twenty20 tournament. The 33-year-old was selected as first pick in the draft for the 2014 season, to run from 5 July to 10 August. Pietersen has signed a contract to play for Surrey this season. International: 37 matches, 1176 runs at an average of 37.93 and a strike-rate of 141.51. High score of 79. 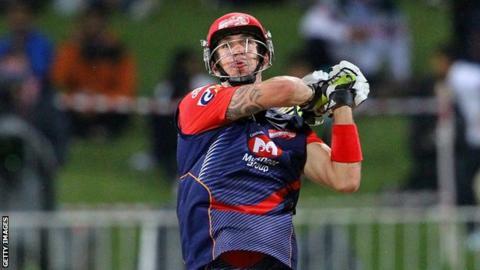 He has also agreed to captain Delhi Daredevils in the Indian Premier League, which will run from 16 April to 1 June. Pietersen was released from his central contract with England in February after being told he was no longer part of the national team's plans following their 5-0 Ashes whitewash in Australia. Shortly afterwards, he signed a new contract with Surrey where he is likely to figure predominantly in the rebranded Twenty20 Blast. His availability will be restricted, though, by his IPL and CPL commitments. A clause in his Surrey contract allowed him to accept an offer in play in the CPL - and with eight-and-a-half-hour direct flights available between London and St Lucia, there is the possibility the batsman could travel back and forth between the two. Pietersen will join West Indies captain Darren Sammy and Australian veteran Brad Hodge at the Zouks, who are coached by former England and Glamorgan batsman Matthew Maynard. The CPL, which is entering its second year, features six teams - one each in St Lucia, Antigua, Barbados, Guyana, Jamaica and Trinidad & Tobago. Those six franchises are building their squads from a pool of more than 200 players auctioned in Thursday's draft, which took place at a bar owned by former West Indies captain Chris Gayle. Former England players Simon Jones, Owais Shah and Dimitri Mascarenhas were not selected in the draft but Ireland's Kevin O'Brien was a sixth-round pick by Trinidad & Tobago Red Steel.